Watching Khal Drogo throw axes with Jimmy Kimmel will make you hot and sweaty. 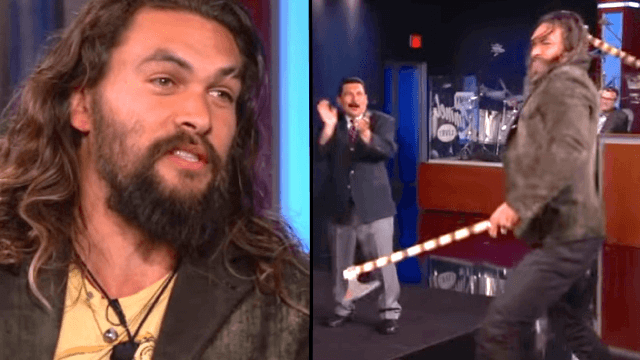 Jason Momoa, who is best known for playing Khal Drogo on Game of Thrones, joined Jimmy Kimmel on Thursday to promote his new show, talk about TV, and put on an impressive display of manliness by throwing axes at a target while holding a beer on live television. Momoa (also known as "pure masculinity on a pair of hairy, strong legs") even forged the axes with his own two hands. Has one single person ever had so much testosterone? Jason Momoa currently plays Declan Harp on the television show Frontier, or as he describes his character: "Me wrapped in fur killing a bunch of English people." Yep, sounds about right. Momoa is also set to play Aquaman in the new Justice League movie, and he might be the only man on Earth who can actually manage to make Aquaman seem cool. We can only hope that producers will have the sense to have him throw swordfish at target or something.